Believe it or not, there was some business to attend to on The Voice Monday besides Adam Levine more or less totally ignoring the #AdamSucks backlash that erupted after he played favorites with his team members during the Top 10 Results Show. The remaining eight singers — including the now-recovered Reagan Strange — performed twice in hopes of surviving Tuesday’s Semifinals bloodbath and advancing to the Finals. Which of them sounded like they were going to be put through — and which of them were likely to get through regardless of how they sounded? Read on, and we’ll discuss. RELATED Sarah Grace (Team Kelly), “Sign of the Times” — Grade: C+ | When I found out that Sarah would be covering Harry Styles, I feared that that would be it for her. Between her difficulties connecting with an audience and the fact that she’s never sounded as comfortable on contemporary pop as she has on vintage blues, no way did I think she’d make it through to the finals. Then she started to sing and at first sounded so lovely, I thought she might just smack the stank right off of my face. But then she had some minor issues in her lower register and what sounded like some major issues on her most humongous notes — it was hard to tell, since she got drowned out by the band. At any rate, it’s rarely a good omen in a singing competition when your coach compliments your musicianship before your vocals. Almost surely in Tuesday’s Bottom Three. Reagan Strange (Team Adam) and Kennedy Holmes (Team Jennifer), “Happy/Tightrope” — Grades: C (Reagan), B (Kennedy) | In a cute pre-performance video, the kids talked about how they were going to go on a presidents tour — since they were Kennedy and Reagan, get it? On stage, Reagan sounded unsure and at times like she wasn’t always singing into her mic; when she was audible, though, she sounded better (and more in key!) than she had in eons. Meanwhile, Kennedy, as she tends to, sounded like she’d just been downloaded off of iTunes. It almost seemed mean to pair them, however. On one side of the stage, you could see Reagan thinking “What comes next? What comes next?” and on the other, there was Kennedy, radiating so much casual star power that you’d swear she’d been playing arenas for longer than she’s been alive. MaKenzie Thomas (Team Jennifer), “Vision of Love” — Grade: B- | Over and over again, MaKenzie’s coach has likened her to the icons that she’s covered — the Whitneys and Celines and so on. And over and over again, I’ve been like, “Yeah, she is good. Really good. But she just doesn’t have their range.” And I always want her to prove me wrong. Here, she almost did. As she began, she sounded, as she always does, lovely but not spectacular. Then came the massive notes, and I couldn’t deny that she was pretty divalicious… at least till the last one, which went a bit off the rails. The echo effect that her coach had recommended didn’t quite pan out effectively, either. The coaches gave MaKenzie a standing ovation as if they’d just heard La Carey do the song. And MaKenzie was good. But Mariah-great? Uh-uh. Could go either way for her Tuesday. 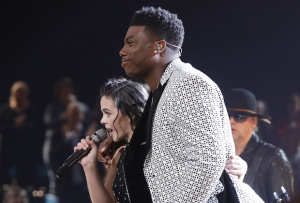 RELATED Kirk Jay (Team Blake) and Chevel Shepherd (Team Kelly), “She’s Country/Country Must Be Country Wide” — Grades: B (Kirk), B- (Chevel) | Bless her heart, Chevel always looks as nervous as a cat in rocking-chair factory when she sets boot on stage. But, if we overlook that or write it off as part of the youngster’s charm, she sounded pretty badass on her end of her and Kirk’s duet blend. He didn’t appear altogether comfortable, either — if he’s not doing a ballad, he’s not doing what comes naturally to him, simple as that. But he nonetheless unleashed a vocal that was forceful enough to blow the roof off of a barn. Nothing I’d run off to download; on the other hand, it was also nothing that would send me running for the earplugs. Kymberli Joye (Team Kelly), “Never Alone” — Grade: A | Long before Monday, the aspiring gospel-music star’s lane had been well-established, and her coach wasn’t about to put the blinker on to change her lane — if it ain’t broke, don’t fix it and all that. So it was hardly a shock that Kelly had Kymberli take us once more to church, this time via Tori Kelly feat. Kirk Franklin. It also wasn’t a shock that she sounded as at-home on stage as she would in a choir, delivering a spirited performance highlighted by a stunning lower register, ecstatic ad libs and glory notes that spelled “glory” in all caps. Afterwards, Kelly hardly had to tell us how fantastically Kymberli had done. She was preaching to the converted. (Unless, that is, you’re not a fan of over-the-top gospel numbers — in that case, you likely hated this.) I’m betting she’s safe on Tuesday. Chris Kroeze (Team Blake), “Can’t You See” — Grade: B | Credit where it’s due: Whenever Chris sings a retro rocker like this Marshall Tucker Band oldie, it always feels authentic to me. Like, if I close my eyes, I can imagine I’m wearing a pair of bellbottoms and riding along in a VW van with pot smoke floating out the window. He seems to like it, too. As he sang, his tangy rasp miraculously rising above all the guitars, he wore a smile that said, “Honey, I’m home.” He could still use a little — OK, a lot — more on-stage dynamism; even Chevel and Reagan try to move around. But there’s no arguing with Blake’s assertion that Chris spoke — or, well, sang — directly to the beer-drinking, backroad-driving (though not in that order!) audience. I reckon they’ll keep him safe on Tuesday. 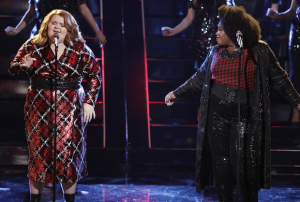 RELATED Kymberli Joye (Team Kelly) and MaKenzie Thomas (Team Jennifer), “Got to Be Real/Best of My Love” — Grades: C+ (Kymberli), C- (MaKenzie) | MaKymberli got off to a dodgy start, even though Cheryl Lynn’s disco classic should have given them both a fine opportunity to shine. They eventually recovered, for the most part, but MaKenzie often sounded off, and like she was straining. (Maybe two numbers in one night and all the rehearsals that had to have preceded them were too much?) Kymberli had an easier time going the distance and sounded more at ease serving disco realness. But overall, this was a noisy, sloppy mess. Made me appreciate Kirk and Chevel’s team-up even more in hindsight. Kennedy Holmes (Team Jennifer), “This Is Me” — Grade: A | We can probably all agree that it’s too soon after Kyla Jade’s emotional Season 14 performance of this Greatest Showman showstopper for it to be getting trotted out again, right? But it turned out the song was no less emotional to Kennedy, who broke down in tears in rehearsal. On stage, the now-14-year-old started off singing clear as bell and moving like she was feeling the number as much as performing it. And as the number built in intensity, she matched it with the ease of the world’s youngest old pro. I’ve heard guest performers — actual famous recording artists — who haven’t sounded as polished and professional as Kennedy. The kid is a star, plain and simple. She’ll not only be safe Tuesday, she’s got my vote for Season 15’s winner. Reagan Strange (Team Adam), “You Are the Reason” — Grade: C+ | Seemed a smart move for Reagan to do another Calum Scott number; her version of his version of Robyn’s “Dancing On My Own” was one of her more sound performances. And this number, like that one, capitalized on the teen’s innate vulnerability, forging a connection between the singer and the song that had sometimes been missing (her simplified “Complicated,” for instance). On stage, she got off to a strong start, especially for her. Though nerves made her voice a little wobbly, she was closer to being on pitch than she had been in weeks. Unfortunately, as she was called upon to swing for bigger notes, she went flat. With training, she could probably be a fine singer. But she’s definitely not there yet. Bottom Three on Tuesday. 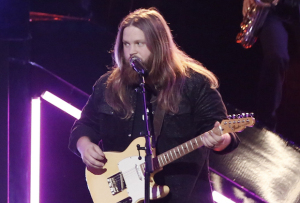 Chris Kroeze (Team Blake) and Sarah Grace (Team Kelly), “Jumpin’ Jack Flash/Chain of Fools” — Grades: B- (Chris), A- (Sarah) | Ah, now this was the Sarah that I’d always thought should make the Final Four. Stank face fully deployed and with a snarl in her voice, she hit the “gas, gas, gas,” and took the hell off. She and Chris even sounded pretty damn good together. The sound mixing needed work, but that wasn’t on them. Had this been a Battle, not a “duet blend,” Sarah would’ve walked away with it — and it takes some doing to out-sing Chris. She just sounded and moved like the real deal. Chevel Shepherd (Team Kelly), “Blue” — Grade: B+ | Ding! Ding! Ding — we have a winner in the category of Best Song/Singer Match-Up. 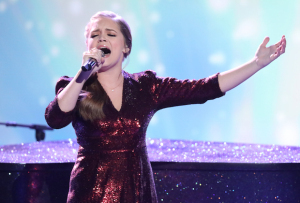 LeAnn Rimes’ first hit was the perfect — and I mean perfect — choice for Chevel. She still had difficulty with her lower register — why not just raise the key? — but overall, she sounded like she was ready to put the grand in Grand Ole Opry. And between the facts that the number didn’t require her to move around on stage much (not a specialty of hers) and allowed her to do that yodel-y thing on the choruses (which is a specialty), I reckoned this country-as-a-backyard-barbecue performance was just the thing to keep her from having to sing for the Save Tuesday. Kirk Jay (Team Blake), “I Swear” — Grade: B- | If Kirk was going to dedicate a performance to a fan who was battling cancer, this should’ve been a good one. John Michael Montgomery’s oldie was a complete and total bullseye in his comfort zone. And it did allow him to radiate sincerity — his stock in trade — and sing with enough emotion to make a listener weak in the knees. But something seemed off for him tonight. His vocal sounded a little froggy at times, and he occasionally kinda threw away the lines that he sang more softly. His glory notes were glorious indeed, but this wasn’t his finest performance — and definitely not the one I hoped he’d give with four singers being sent packing on Tuesday. I figure he’s still safe, but jeez, this wasn’t the slam dunk that it should’ve been. So, what did you think of the performances? Did Reagan redeem herself, as her coach so hoped she would? Vote in the polls below, then hit the comments.